Vivid in my mind are our families’ visits to Uganda. I recalled their faraway presence in faded watercolours and this vexed me deeply, but our holidays together left bright, tangible memories. Their visits invigorated us as we viewed our world once more through unknowing eyes, marvelling at it all over again. Rick’s parents, Paula and Bryan, were visiting, enjoying the anticipation of their special first grand-child. They had never been abroad apart from Spain in 1970, where a bout of Barcelona Belly ensured they never went back again. En route now from Entebbe airport, they were agape at the candlelight markets and the colour and clamour of the Ugandan streets. We had an intrepid safari lined up over in the west of Uganda, right up against the Rwandan border. Things would be interesting! The Landcruiser was checked over, quiches and home-made bread were baked, and the dog and cat weighed. Hang on a minute, what? Oh, yes. 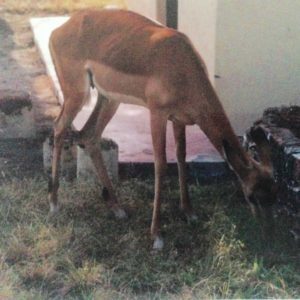 Weighing the dog and cat: while we had been in Mombasa, we had done the usual of leaving enough money for Fabian to buy meat for the dog and cat; except on our return, the dog and cat were visibly thinner and Fabian visibly fatter. So I announced that we would be weighing the dog and cat before and after holidays from now on. 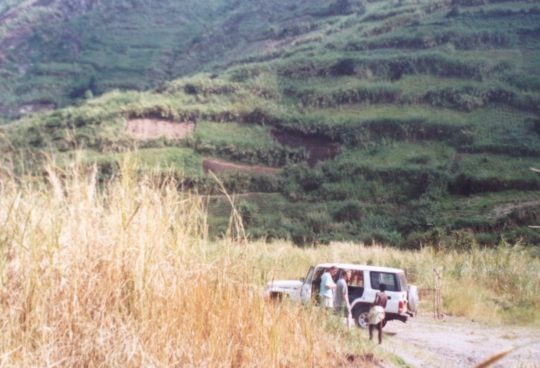 As we drove into the African countryside, I watched the reaction of my in-laws. There was a sense of wonder as they took in the real mudhuts, the villagers washing their clothes in the rivers and the constant stream of Ugandans on either side of the road, pushing bicycles loaded with Matoke bananas and balancing piles of firewood on their heads. I could tell Paula and Bryan were a bit apprehensive about sleeping in mud huts and the unfamiliarity of self-driving through Africa, but that wore off after the excitement of crossing the equator into the southern hemisphere, and by our lunchtime picnic beside Lake Nabugabu they were old hands. OK, our huts in Lake Mburu housed a myriad of bugs and the loo was a long drop with flies around a horrendous whiff, but we had the offer of a hot shower heated in an oil drum, which went down a treat. In the blue early morning light of the next day, Paula opened her hut door and walked straight into an impala standing right there. We spent the day driving south, through herds of zebra and impala on the plains. 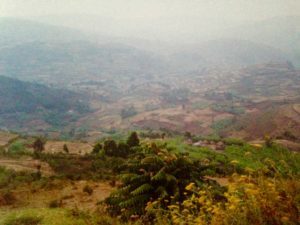 Gradually the brittle yellow of bush scrub morphed into lush green valleys with terraced hillsides and the wide grasslands of Africa enclosed within their walls. The temperature was dropping, so that we kept putting layers on. Bryan kept saying “Brilliant. It’s just brilliant”. Finally we reached Kabale, Fabian’s homeland, in the cool hills overlooking the Rwandan border, and our destination, The White Horse Inn, to find it packed with UN observers and troops using it as a base for their operations in Rwanda. In Africa, you cannot walk long alone. I found out that in African culture they think it sad if you are alone and will go out of their way to accompany you. The next morning we went for a walk out of the hotel with no real idea of where we were going. We picked up two 8 year olds, who acted as our guides, taking us higher and higher until the hills plateaued out and there were 360 degree panoramas for miles and miles around. We were standing in meadows full of alpine daisies and I felt like Julie Andrews in The Sound of Music (only larger). We asked the children what the flowers were and finally deciphered that it was pyrethrum, a medicinal plant used as an insect repellant, which grows well at these heights. Rick made a mental note that it was a great idea for a business. 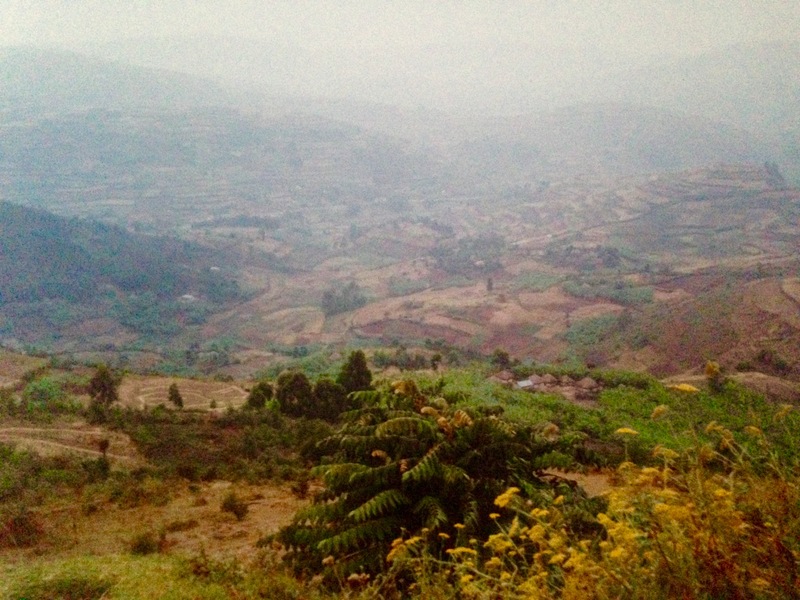 After a picnic of home-made egg sandwiches and fresh mango, we set off driving south towards Rwanda to explore. 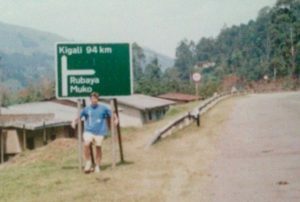 Within a mile of the border we saw a sign saying “Kigali 94km”. The spot was remote and beautiful, the mountain air fresh and a light mist was hanging across the fields. Abandoning the car, we went for a wander down a dirt road, and as we rounded a bend, we inadvertently became privy to a most intimate scene. A group of six naked villagers were bathing in a warm cattle pond in a dip surrounded by farmland. They were washing and talking in low murmurs, completely absorbed in what they were doing. Because we happened upon them, it was too late to turn back. 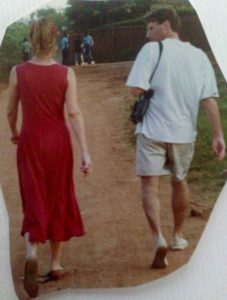 They looked up and were embarrassed, (which threw me as most rural Ugandans seemed happy to expose their bodies). I felt like an intruder, that this scene was not for my foreign eyes, that it was a private world to be kept hidden here, not captured and taken away. We left sheepishly, though secretly I was pleased to have shared in the harmony of that little vignette. I suspect those six Ugandans were in complete ignorance of the vulgar behaviour only a few miles away that was reaching the extremes of human brutality. We found out when we returned home that this is called Kacumbi hot springs and it is Fabian’s village! Those bathers were quite likely his relatives, which was a thought that warmed my heart. 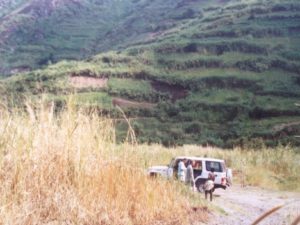 We travelled north the next day, skirting Bwindi Impenetrable Forest, home of the critically endangered mountain gorillas, into the heartland of Ugandan bush. Finally, we came to the edge of the escarpment where the land drops away and before long, we were driving along the plains below, much hotter and drier and with very different flora and fauna. Queen Elizabeth National Park, heaving with game and birdlife, is bordered by Lake Edward to the south-west and Lake George to the north-east with the Kazinga Channel running between the two bisecting the park. Our lodge was perched above the channel with views of elephant and buffalo on the other side drinking at the water’s edge and the sound of hippos grunting their contentment for all to hear. Safari was seeping into our blood and circulating the message “All will be well” to every cell in our bodies, so that – with ice cold beer in hand and stunning sunset on display – one could not help but be at peace with the world. In the middle of this safari was an event that could have changed our lives forever. Accidents happen more often on holidays. I expect this is because we are faced with unfamiliar situations and we react in the wrong way. Anyhow, this is what happened on that safari. 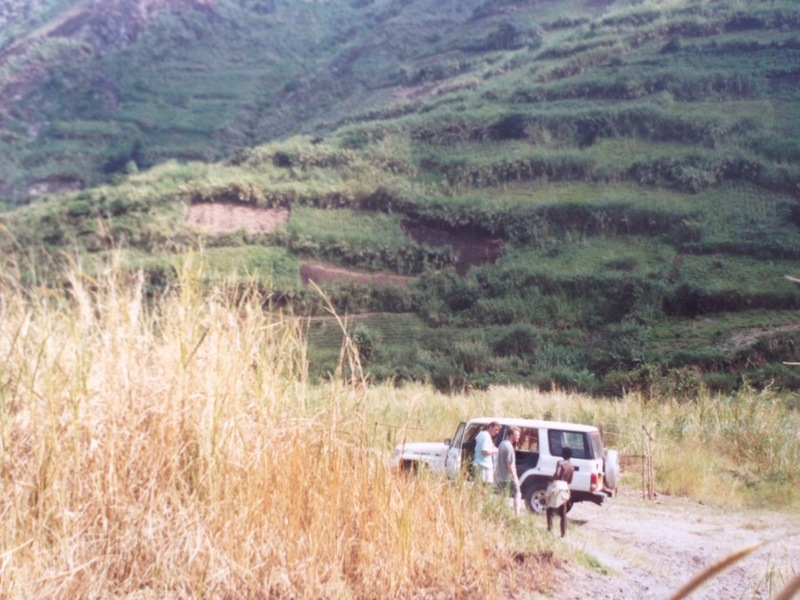 The following day, we hired a guide to take us off the beaten track. We enjoyed the company of four elephants lumbering between thorny acacia bushes near the dirt road and later saw two lions sauntering off into the shade. 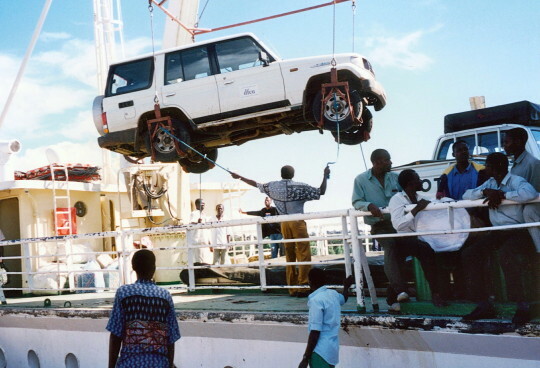 Then, rather unusually for safari, the guide took us to a remote fishing village. Later, thinking back and trying to work out why he would have taken us there, I supposed he was trying to lay on something a bit special for us. 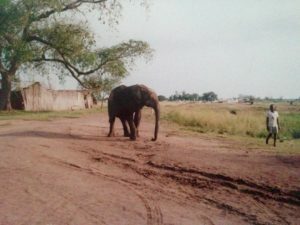 As we pulled up, he explained that an elephant had been abandoned here by its herd five years earlier and adopted by the villagers. He gave the impression it was now tamed. We got out of the vehicle and our guide disappeared. The elephant was feeding under a tree on tulip flowers, and though by no means fully grown, was a hefty beast, bigger than our Landcruiser. We were standing in a clearing chatting, actually I think the baby had just kicked, so nanny-to-be was trying to feel the movements through my large bump, when I became aware of the elephant ambling towards us. He looked a friendly fella and I walked towards him arms outstretched, as you would to pet a horse or a donkey. 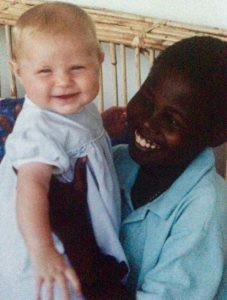 I can still remember the dress I was wearing – it had a red pattern on brushed cotton, and was one of my favourite maternity clothes. He advanced on me, and then kept coming until I realised he wasn’t going to stop. Before I had time to react, he butted me to the ground with his tusks. I found myself flat on my back in the African dirt under the elephant, my head between its two front feet. The left side of my abdomen was smarting. I remember seeing the red hem of my dress lying in folds against the leathery skin of his front foot and thinking how enormous his toenails were. I remember being calm, not scared in the slightest, but my left side was burning. That moment is quite frozen in time. Then Action! My mother-in-law ran over squealing, and pulled me out by my shoulders from between his swaying tusks: incredibly brave of her. The guide materialised with a huge bunch of bananas and lured the elephant away. Then the others rushed over to help me to my feet and all at once were fussing, desperately worried for both me and the baby. It was all a bit inelegant of me, dress round my waist, large expanse of pregnant belly showing. It did, however, allow us to inspect the damage. There was a graze the length of my pregnant belly with bruising, where the elephant’s tusk had knocked me over. My! What stories we would have to tell this baby, who was kicking like crazy, reassuringly. We were unduly attentive to the movements for a long while after the incident. Classic Fabian comment to go down in the annuls of Phillips family history and repeated many times whilst giggling into our cups of tea. Dear Fabian, you provided us with so much entertainment. 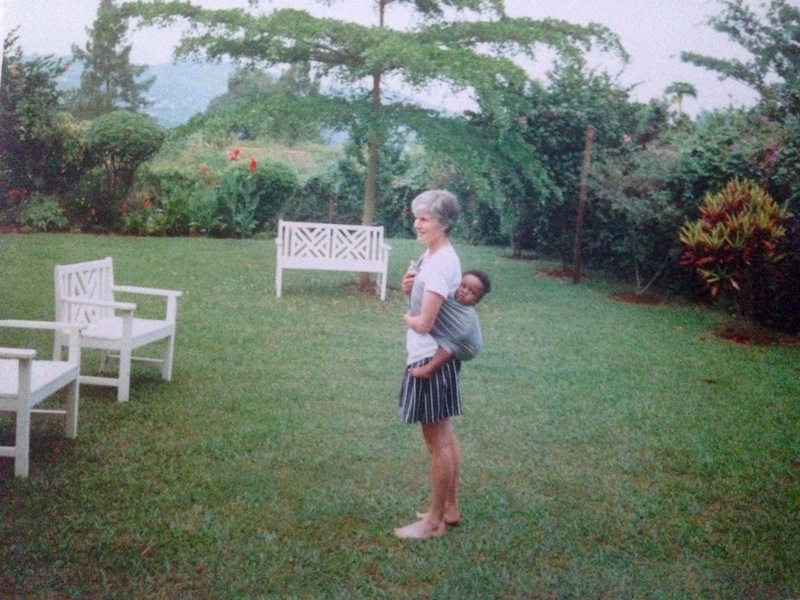 Paula and Ronnie – African style! Home to tea and birthday cake on the verandah, then Paula and Bryan produced presents of peanut butter, shampoo, Draft Guiness and two week old newspapers. Deprived of these normalities of English life, we found them promoted to luxuries which gave us pleasure out of all proportion. An evening of prime Ugandan television finished off a superb 29th birthday and Rick’s parents last night with us. There was only one channel. Tonight’s viewing for the nation was a Ugandan soap opera called “That’s Life, Mwatu!”, Mwatu being Luganda for friend. An American teacher friend of ours moonlighted as an actor, and was the central character of the show, in which he was having an affair with his Ugandan maid. It was hilariously terrible – Crossroads Motel on a bad day. This particular episode ended on a cliffhanger (they had just been caught at it, I think), where the cameraman panned to the bare light bulb hanging from the centre of the ceiling, zoomed his camera in and then shook it for effect, of course with lots of dramatic music for the final impact of doom. “Mr Hassan doesn’t actually play football, but I’m sure he’ll have some interesting comments for us tonight”. Count down. A month to go until I fly home to have the baby! So much to do! 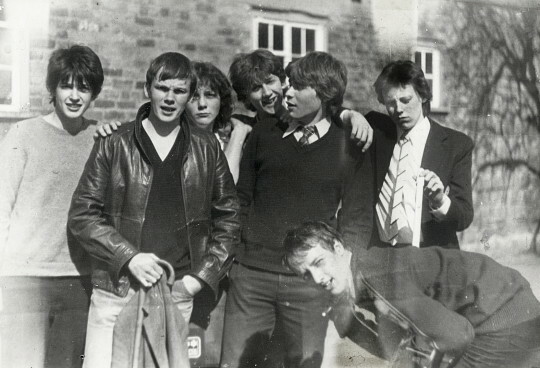 I was working full-time and still had two Sailing Club events to organise, a school science competition to judge and a rugby match to cover as the Sports Medic. It was no wonder that I was feeling tired. Doc Gibbons ran a few blood tests just in case and found that I was severely anaemic. A blood transfusion was out of the question with so much HIV around, so I was whacked on high doses of Iron tablets. There was another complication. The baby was transverse – sideways instead of head down – and things were getting a bit tight in there for it to turn naturally. The implication is that the birth can be more risky. Doc Gibbons was a genius. He attempted what most obstetricians these days are reluctant to do: an external cephalic version. Basically he used his hands on my abdomen to coax the baby round to the right position. There was a pop as I felt the little beauty slip into position. Thereafter I was instructed to put bricks under the foot of my bed until the day I flew. I loved this practical, no-nonsense approach to Medicine. My next event at the Sailing Club was a Beach Volleyball competition. Pepsi and Coca Cola were battling over sponsorship – I had to pinch myself that these two giants were fighting over my tournament – with Pepsi the winners, berating me for approaching their rivals. Twelve teams were competing, including two national players and I had sold over 100 tickets to spectators. I was, however, waking up in the middle of the night with nightmares. The shoreline was being choked by an invasive weed, water hyacinth, which left debris all over the beaches and I pictured the day of the event with piles of weed all over the volleyball courts. In the end, we were spared this disaster, and Rick was thrilled that Entebbe Sailing Club, captained by him, made it to the final. 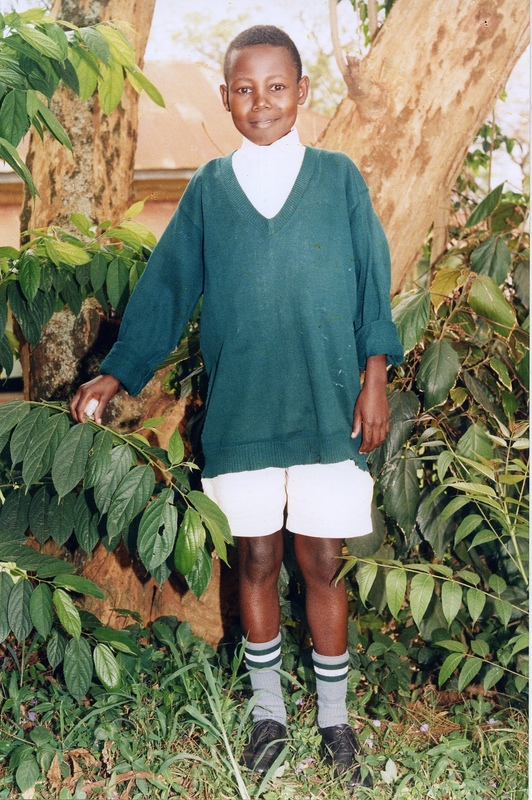 For me, the day was poignant as this was the first time we had taken Kalanzi out of his boarding school in our new capacity as ‘weekend fosters’. 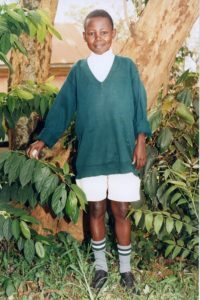 Already this special 15 year old orphan, who bore his heart condition so bravely, was important in my life. I looked forward to his company, his bright conversation and the enormous smile that rarely left his face. He made the day memorable just by being a part of it, not just for me but for everyone who took the trouble to talk to him. 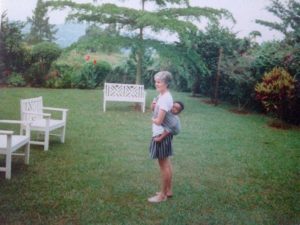 You soon realised that the little Ugandan boy sitting on the grass bank with skinny arms and legs and a bloated abdomen, was in fact a young man with strong ideas of his place in the world and a keen interest in history and politics. The rugby match I doctored was unremarkable apart from an incident which still makes me chuckle. Bearing in mind I was nearly eight months pregnant and enormous, I looked a bit out of place on a rugby pitch. Towards the end, a player went down and the umpire missed it. I’m not supposed to run onto the pitch without the game stopping, but this player looked in distress. I ran into the midst of it all, waddled would be a better term, to whistling and cheering from the crowd, which at least alerted the umpire to stop play. I’m sure he thought I was a concerned wife – I didn’t look your typical sports medic. The player, a hulk of a guy, had torn his hamstring and I had to support him off the pitch. We made an incongruous duo: muddy rugby giant leaning on heavily pregnant woman, encouraged by a field full of clapping spectators. It felt more like a lap of honour but for all the wrong reasons; for those of us challenged in the centre-of-gravity department. John Cleese’s ‘Ministry of silly walks” sprung to mind as I prayed the ground would swallow me up, dishy rugby player and all. 7.00pm: At home in Fladbury and Kate started having contractions, every 3 minutes. Its not supposed to come this fast. 11.30pm: In the Blue Room on the labour ward. Kate quietly getting on with it. She sat on a chair, looking very tired – she sat there hour after hour using the TENS machine. 11.00am: Kate moved to the bed on gas and air. She looks in such pain and I can’t do anything about it. I wish I could do something to help her. Currently 12.30 and I am rubbing her feet. Contractions every minute or so. Now 3.30pm: Excitement! Now reached final stage. Still could be 2 hours though. K a bit spaced out on gas and air. She likes having a cold flannel on her face. 5.40pm: Oh no! What’s happening? The midwife has gone to find the consultant as it’s not moving fast enough. Does this mean forceps? What does that mean? Wish I had been to some ante-natal classes. Kate seems as weak as a kitten. I hope everything OK.
6.00pm Midwife urging Kate to push, but the baby isn’t coming. I am spurring her on like in a rugby scrum. 7.00pm Its getting a bit scary now. We have come through to the delivery room and there are lots of new midwives and equipment. A quietly spoken Doctor has just said he will give Kate one last chance, and then it will be forceps. Poor Kate is so tired. 8.30pm. Suddenly Anna arrived! 7lb 13oz healthy and surprisingly beautiful – not like a new born baby/prune. They tried high forceps, the ventouse plunger, then finally success with forceps again. It was so overpowering and emotional. All at once Kate was back to normal. Been up most of the night with Anna. The ultimate hangover cure. Have a baby and you’ll never get drunk again!